They’re back and they’re getting married.. or at least that's the plan! Fresh off the back of three sold out seasons, this hilarious cross-cultural journey continues as Alex and Eve try to prepare for an Orthodox-Muslim wedding. With neither family giving an inch, strap in for an uproarious car-crash!!! Six months earlier, Alex fell in love with Eve, a beautiful corporate type. There was one problem – Eve was Lebanese-Muslim and their parents went berserk!!! Months later Alex and Eve meet again and with the feelings still there decide to get married. Come and join Alex and Eve as they embark on the most important chapter of their lives … their wedding. The big question is WILL IT HAPPEN? Even though we had never planned to continue the story and leave audience to decide it themselves the idea stuck with us. What would happen next? We had purpously left things handing for the audiences imagination but we found that as more people asked, we wanted to know as well. Alex then spent the next few months jotting down ideas of where the characters could go before finally sitting down to write a first draft. Once it was ready the team had a chance to read it and then we got together to discuss. Over the next few we hours we picked the story apart and put it back together again, then the unthinkable, we decided to change the story completly. After a few weeks Alex came back with a new draft, and blew us all away it had, comedy, romance, drama … and a dance number? Alex continued to refine the draft further into the play we performed at the Factory Theatre in May of 2009. We couldn’t have anticipated the response we had. Initially we booked the theatre for two weeks, figuring that 8 shows would be plenty, boy were we wrong. Before opening night came the show had already sold out and we were announcing more dates resulting in a further 5 shows, all of which sold out. This was topped off by a final gala sold out performance at the Enmore Theatre where we were joined by Sabrina Houssami and Zoe Carides. 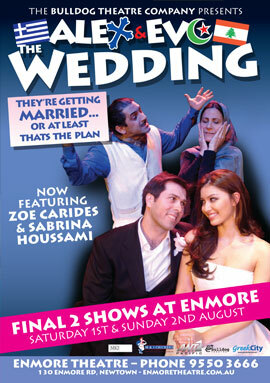 The Factory Theatre in Marrickville was the location for the second entry in the Alex and Eve series and was originally scheduled for a two week run with shows on Thursday – Sunday. This was greatly extended.